The Raspberry-Pi will be with us soon. 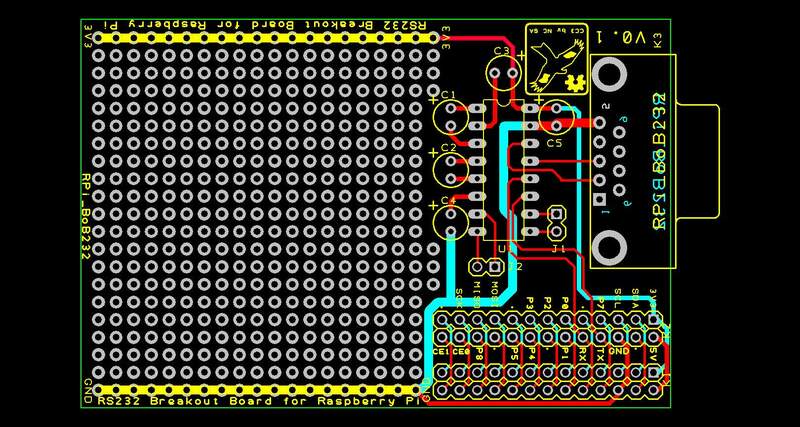 In the mean time I would like to share a little RS232 breakout PCB I”ve designed for use with the RPi. It”s a simple RS232 circuit using a MAX3232 chip connected to the UART Rx and Tx of the RPi. I”ve not included any mounting holes as I don”t know if the final RPi will have any, although I hope to add some for the next version. It was pointed out on the RPi forums that the RPi’s 3.3v supply is limited to 50mA so I may add a 3.3V regulator to the circuit. A MCP1703 from Microchip was recommended, The addition current from an additional 3.3V regulator will useful if you want to use the prototyping area on the breakout board. That said the RPi’s 3.3V at 50mA is enough for the MAX3232 by itself. You are currently browsing the Zuzebox's Blog blog archives for January, 2012.